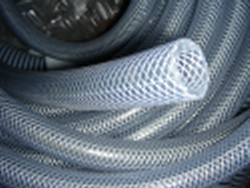 100' of 1-1/2" ID Clear Braided PVC tubing, aka, hose. Non-toxic, FDA approved for use in USDA meat and poultry plants. ID: 1-1/2", OD 2", WP (Working Pressure) 75PSI, BP (Burst Pressure) 300PSI. Note: This hose will also fit 50mm DIN Sockets very well.